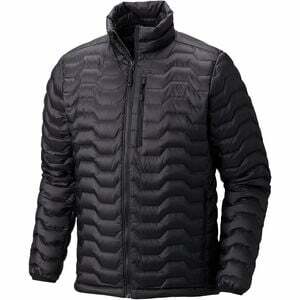 Jack-of-all puffies, the Mountain Hardwear Men's Nitrous Down Jacket is bound to surprise you. Weighing in at less than a pound, this versatile insulator packs down easily when you need to load it up for an alpine expedition or cut down on weight while heading out touring. What sets it apart from similar down puffies is its hydrophobic Q-Shield Down. Most down will lose its loft and warmth when it gets wet, but hydrophobic down resists moisture to stay warmer for longer and dry quicker, so you've got backcountry assurance when you're on a backpacking or touring trip. You've got standard hand pockets for every day convenience, with a chest pocket and two internal drop-ins for gear storage when you can't be bothered to go rummaging in your pack.